He sets the whole world laughing ... there's even Laughter in Paradise ! Deniston Russell: I couldn't possibly burgle somebody I didn't know. I first saw this as a youngster and liked it, but over the years it's really grown on me until now I regard it as a minor classic. The main characters were all played excellently, with many lesser characters also played memorably. Practical joker Hugh Griffiths dies and leaves GBP 50,000 to each of his four living relatives if they complete various silly but onerous tasks within one month of his death. 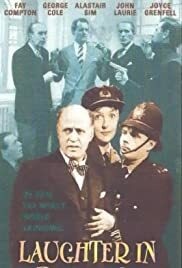 Pulp writer Alistair Sim, snobby Fay Compton, womaniser Guy Middleton and timid George Cole are all faced with problems that are against their natures, and their attempts to succeed ultimately result in a worthy moral and laughter on Earth. Cole's "juvenile" sections used to irritate me when younger but there's plenty else to savour, especially the incomparable Sim as a determined shoplifter, Compton as a harassed skivvy and Middleton as a hornswoggled suitor. As icing on the cake there's also fluffy Joyce Grenfell, scathing John Laurie, suave Anthony Steel, jolly Ernest Thesiger, and many other old friends – even the forever bald Noel Howlett and a young Audrey Hepburn. The direction and production values were top notch too; the sets were so beautifully wooden, the acting certainly was not. It's flimsy yet logical, life-affirming and recommended – stay with it to the end to have the last laugh.